All transactions are safe and secure with a reliable history in online purchasing behind each of our associates. Buy the Dr. Gregory House I Don't Like Anyone t-shirt to own House clothing and merchandise. 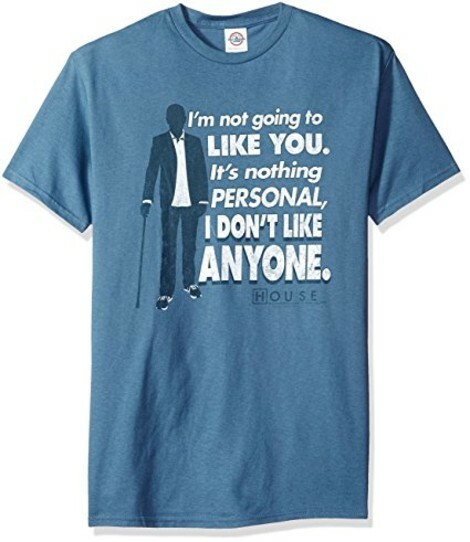 This House tee displays the Dr. Gregory House (Hugh Laurie) quote, "I'm not going to like you. It's nothing personal, I don't like anyone." The good doctor can be seen standing next to the quote holding his cane. Wear this shirt as you repeat your favorite Hugh Laurie House quotes and houseisms. In addition to the Dr. Gregory House I Don't Like Anyone tee above, browse the House Clothing Gallery for more apparel like men's and women's clothes, kids shirts or hoodies.